The American company Starsky Robotics is now one of the most ambitious companies in terms of autonomous trucks. The concept : a driverless truck. Trials have been done in Florida, on approximately 11km of roads open to normal traffic ! 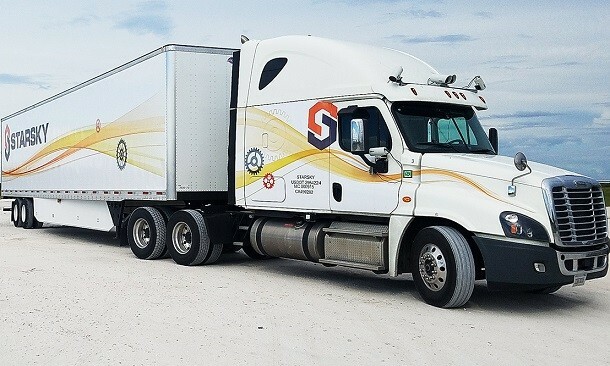 Starsky Robotics stands out from other manufacturer of autonomous trucks with the unique long distance guidance concept. They don't want a driver in the cab anymore. Instead, the "driver" will be able to drive and control the operations from a distance, in the comfort of an office. In order to reach this ambitious goal, Starsky Robotics has more than 16 million euros from a recent fundraiser. The trial period on open roads is an important step in the project. In order to continue its development, the company now wants to set up long distance driving centres (at the periphery of large urban centres) where operators will work at. Each of them will have the responsability of a fleet of 10 to 30 trucks via screen giving them the same vision as a driver and giving them additional information. If needed, the operators will be able to completely control the truck. Starsky Robotics wants to make real deliveries for their clients before the end of 2018.